"Good afternoon. My name is Richard Pletcher. I am the founder of Amish Acres and the producer of The Round Barn Theatre. 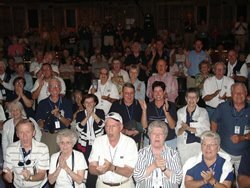 Welcome Penn State Alumni to this command performance of Camelot, the classic tale of King Paterno and the Knights of the Round Table; the king who never lost a battle and ruled for an eternity in a happy valley where all of his subjects worshiped him and bowed at his feet. I am here to tell you that as a lad growing up in the shadow of the Golden Dome, an all-northern Indiana first team halfback at Nappanee High School, with the nickname “Moose” bestowed upon me for my obsession with Notre Dame’s famed athletic director Moose Krause, and as a graduate of Indiana University, the Big Ten’s perennial football doormat, where I ran the IU card section enticing with free tickets barely enough students to make the “I” without the “U”; with all of these distractions and coverups, deep within my heart of hearts this “N” on my high school letter jacket has always stood for the Nittnay Lions." I then cued sound engineer Nate Rux to crank up the Penn State Fight Song at maximum volume. They bought it hook, line and sinker. The 44th Annual Amish Acres Arts & Crafts Festival held on the historic farm’s grounds is being dedicated to the 44th Regiment Indiana Infantry (1861-1865), which fought at Shiloh, Murfreesboro, Chickamauga, and Mission Ridge, to preserve the Union. 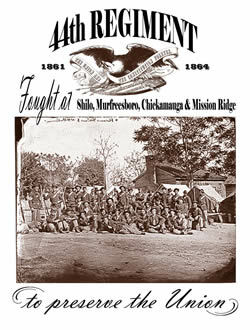 The 44th regiment of the Union Army was organized in the Tenth Congressional District and rendezvoused at Fort Wayne, Allen County, Indiana in October, 1861. In December, the regiment left for Henderson, Kentucky. It camped at Calhoun, Kentucky, until February, 1862, when it was transferred to Fort Henry. The 44th Indiana moved to Fort Donaldson and participated in the siege of the fort, suffering considerable loss in killed and wounded. It was engaged during both days at the battle of Shiloh. Serving throughout Kentucky, Tennessee, and Alabama, the regiment fought at Murfreesboro, Chickamauga, and Mission Ridge. It was assigned provost duty at Chattanooga, Tennessee before being mustered out in September, 1865. Indiana raised 137 infantry regiments, 13 cavalry regiments, 26 batteries of light artillery, and 1 regiment of heavy artillery. Over 150,000 men served the Union from Indiana. From the 11th Indiana Infantry Regiment, Lew Wallace became one of Indiana’s brigadier generals. His greatest achievements may have been his literary pursuits. His novel, Ben-Hur: A Tale of the Christ (1880) has never been out of print and has been filmed three times. The Grand Army of the Republic Highway, designated to honor the Union forces during the Civil War, runs in front of Amish Acres gate. When completed U.S. 6 was the nation’s longest transcontinental highway from Provincetown, Massachusetts to Long Beach, California. The tee shirts weren't very popular. Some said they couldn't wear them in the South. I think the point was missed. We had 13 shirts left over. Recently a fella walked into our shop, saw the shirts, and bought 9 of them. His great grandfather was a member of the 44th. You never know.